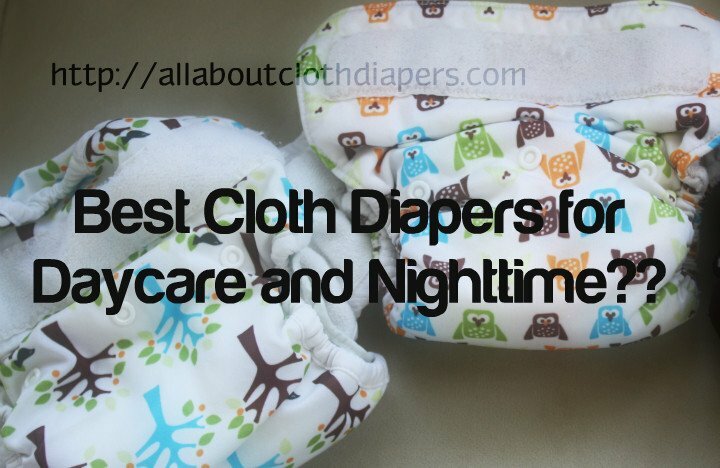 Questions about nighttime cloth diapering, washing and recommendations never stop flooding my inbox. I was wondering if you could give me your opinion. I have a 3 month old that I have been cloth diapering since 4 weeks. She was only 5 pounds when we left the hospital and just a little over 6pounds when we started CDing. I had bought some Flip diapers, but they were way too big for her so I tried Cocalo Perfect Bum, which I love! However, my daughter will be going to daycare and I don’t think they will like dealing with the inserts so I have been looking into getting some AIOs. I have narrowed it down to Rumparooz or Bummis Easy Fit, both of which you recommend. I am not a big fan of pockets (hate stuffing them), but I love the gussets on the Rumparoozs. The gussets are one of the big reasons I like the Perfect Bum. I also like the stay dry material that would be next to my little one on the Rumparooz. However, I also like the Bummis for ease of use and that it is a little easier to stuff and it automatically comes out in the wash. Out of these 2 diapers, do you recommend one over the other? Which one would you pick up first? Additionally, is one better than the other for overnight? My daughter sleeps 10+ hours a night and has since 2weeks. Right now she wears a disposable at night because I have been too afraid to try CDing at night. The one time we tried she ended up with terrible redness on her bottom in the morning. First, I address the daycare situation. Daycare workers love easy…I love easy. So, my first recommendation was actually not one she suggested. Thirsties Duo AIOs are an awesome, Made in the USA, readily available, simple cloth diaper for anyone to use. Thirsties AIOs (review)are available in snap or aplix and have a tunnel pocket where you can easily add more absorbency when needed. It isn’t necessary to remove the added inserts before washing as they will agitate out. Hemp is a super absorbent, trim doubler I like to add under microfiber. Hemp Babies Doublers and Pooters one-size organic inserts are uber trim and soak up a lot of moisture! For more info on doublers check out What Are The Best Cloth Diaper Doublers? Regarding the two brands Kimberli asked about- Rumparooz One-size Pocket and Bummis (Bummis is simply the US distributor for Tots Bots, but it is still called the Tots Bots Easyfit), I would recommend both depending on the desired versatility. Tots Bots Easyfits are great AIOs with a super soft minky inner. I love the aplix closure and the tongue soaker that agitates out on its own in the washer. However, I would be more inclined to recommend Rumparooz overall to most users. One, Rumparooz has the unbeatable inner gussets called the “Poop Scoop”. Two, they are very versatile. Rumparooz can be used day or night, skinny or chunky child, tall or short toddler, and they results are almost always successful. And last but not least, the Rumparooz 6r soakers are amazing. They are available in microfiber, hemp or bamboo. Rumparooz recently released a new print and two new solids: Preppy, Peacock and Phantom. I’ve used many more combinations over the years, several of which are listed in the Nighttime cloth diaper category. For nighttime I would recommend BG 4.0 or AIO if 4.0 doesn’t fit yet. I actually have only used Bum Genius at night but they have the best stay dry and they never leak. (not all stay dry is the same). Day time we didn’t use stay dry. I used BG 3.0/4.0 with the OS microfiber insert it comes with and joey bunz hemp most of my sons diapering. Whether he was sleeping through the night or wearing it through 3-4 nighttime nursing. Worked great! Make sure and check out Spot’s Corner on Hyena Cart!! I bought 3 EUC Ragababes last night.